We telephoned Calcutt Marine this morning to ask about a 1000 hour service for the Hurricane central heater. It’s a simple job but I’d like the UK distributor to do the first service (after 3 years of use). 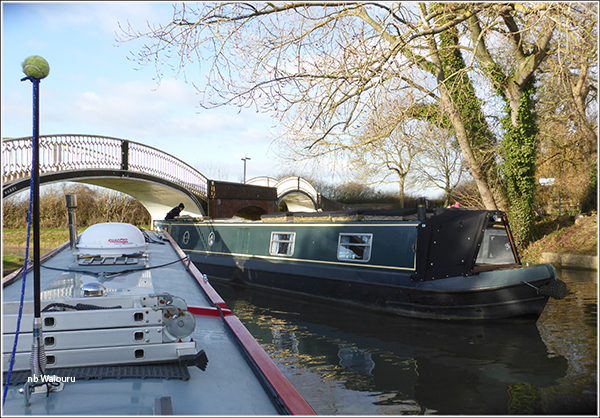 They can fit us in on the 10th and after looking at the weather forecast we decided to move from Braunston today. 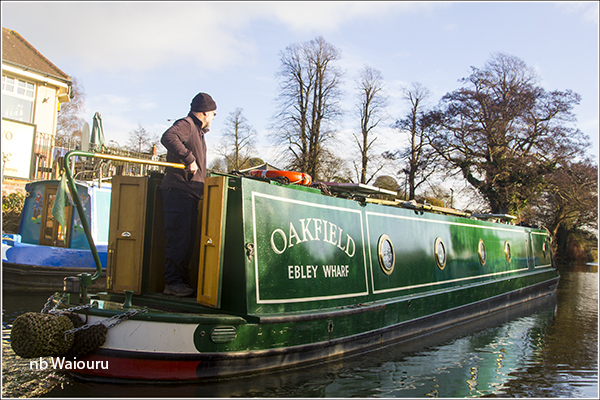 We were just sorting out the interior pre-departure tasks when Oakfield passed with Keith at the tiller. Just time for a quick photo. The first job was to cruise down to the services block and dispose of the rubbish whilst simultaneously filling the water tank. That done, we reversed back to the junction and headed towards Wigrams Turn. Not quite as easy as it sounds because the junction became rather busy with a boat and butty heading towards Hillmorton which actually wanted to moor at the Swindlers. Then a boat appeared from the Wigrams direction as we were attempting to turn. All was eventually sorted. 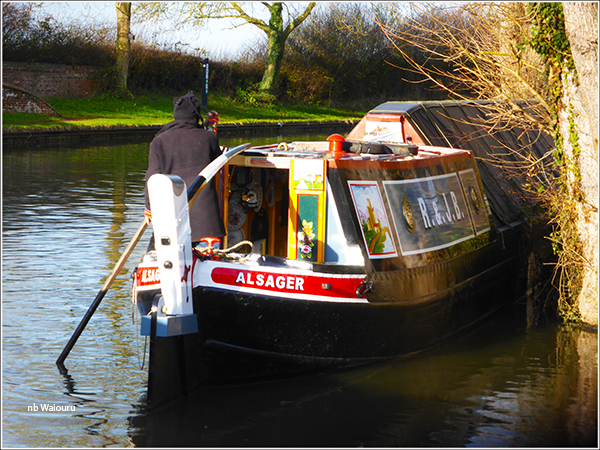 Why do you always meet a boat at a junction or bridge hole? The weather was clear and sunny but rather cold. Around midday the sun disappeared and black clouds started to appear from the NW. The mercury dropped and I started to shiver slightly despite the thermal vest and knitted jersey. The smell of hot bread was seeping from the back cabin. Then a hand extended from the slightly open hatch offering me a freshly baked filled roll. Just as we reach the junction at Wigrams Turn Jan said she had felt a drop of rain. “Please hold off for another 20 minutes!” Light sleet started to fall just as we reached the concrete edge to the towpath above Calcutt Top Lock. The well oiled mooring crew got to work and five minutes later were were inside a cheery warm cabin. This is almost exactly the same spot as a month ago. The sky is now a dirty grey and gusts of wind are making Waiouru rock slightly. Got our timing right! There were a couple of small maintenance jobs I was going to do outside, however I’ve changed my mind!